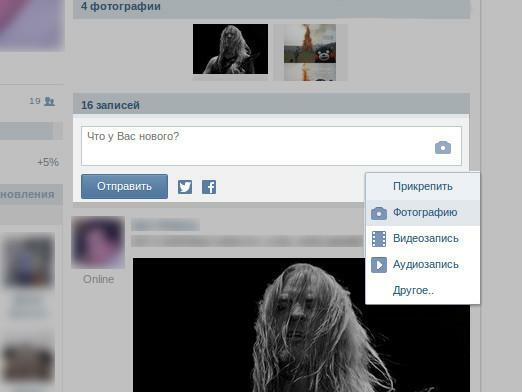 Newcomer in social networks is sometimes difficult to understand the functions of the system. He sees, others communicate, add photos and videos, create polls and are popular groups. Man also wants to quickly settle into a new environment, so he is looking for answers to their questions, and we told him to actively help this. for example, Now we will tell, how to add to the wall in contact interesting event, note or poll. The fastest way to start a conversation with interesting people – create a poll on the page. Let's see, how to do it. Since the possibility of placing in contact polls appeared relatively recently, not every user the first time make it right. Open your page in touch. Find the line “What's new with you?”. Under it is a button “Attach”. push it. Drop-down list of, that can be selected for attachment. Put the cursor on the line “Survey”. push it. The precipitated table fill interrogation field. Write topic poll, which clearly formulate your question. Then we arrange the response options. If more than two options, then click on the “Add” button under the last line of survey. After finishing design, click on the “Add a poll”. You can set parameters, open access to the results of all the user's contacts. Or make private are visible only to yourself. Added poll appears on your wall, see it all friends, vote, thereby spreading it among other users. After some time the poll is closed, you will get the results. To add a picture on the wall, click the same string Attach. From the drop down list select “Attach picture”. Follow the instructions and place the picture of application. If you need to add a picture on the wall to your computer, click “attach” button in the “picture. In the opened interface click “Add image”. Upload photos to the site, or use already placed in your folders pictures. Not only on your wall, you can spread the exciting news, pictures and video files. On the walls of your friends are also available for downloading pictures. tell, how to add animation to the other wall. Copy a link to an animation image in the address bar of your web browser. Opens the message box on the wall of a friend. You insert the copied link. In the window messages appear animation. Now you can remove the link. Click the button “send” animation, and successfully took a place on a friend's wall. This is how easily and naturally can be added to the wall in contact pictures, polls and even the animation.Learn with us and soon you will become a successful user of a social network “Vkontakte”.